On sale on a downtown Damascus pavement: "Zallouh Root: Sexual booster, general booster, for diabetes, nerve problems and back pain"
Zallouh is made from the root of the herb Ferula Hermonis, which grows at the height of 2000 meters above sea level on Mount Hermon between Syria and Lebanon. It has been used as an aphrodisiac since ancient times, and it is a well known folk remedy in some parts of Syria and Lebanon. It's chemical powers and benefits were studied and confirmed by doctors and scientists a few years ago, and the word spread worldwide. 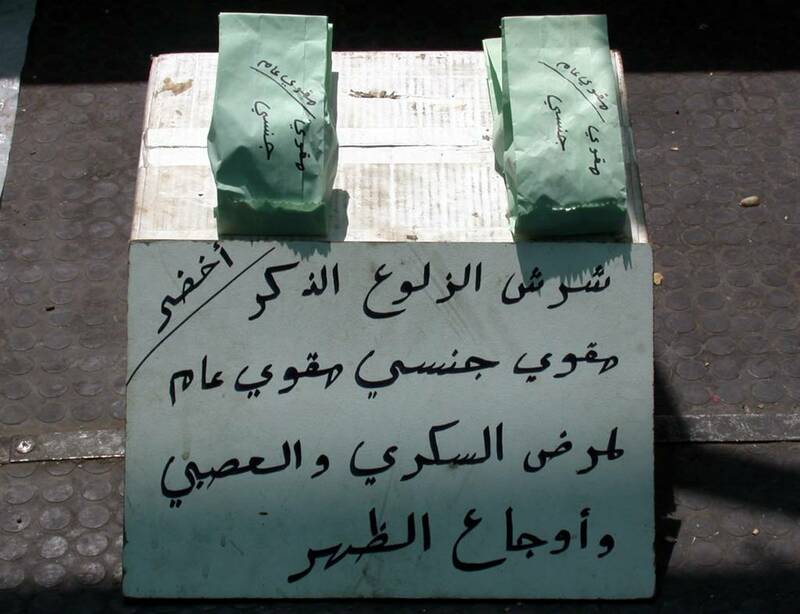 It was described by CNN in 1998 as the "Lebanese Viagra." What a lovely product.. I'm suprised it doesn't cure cancer as well.